The S-BOX Knife Box is a countertop pop up box to hold your knives, it features a 3mm wide slot the entire width of the unit, the lid on the top of the box hinges up to easily be able to store and remove your knives. The Knife Box features a brushed stainless steel top however you can also add your own custom top such as granite to it, this allows for a seamless and beautiful look that hides itself in any kitchen. The Knife Box can be installed to show just the brushed stainless steel top or your own custom top such as granite, quartz, or timber. 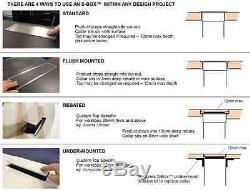 There are 4 ways you can install the Knife Box. 1: Standard: Surface mount showing stainless steel top. 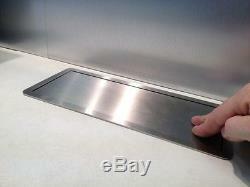 2: Flush Mounted: Recessed showing stainless steel top or custom insert. Rebated: Custom created ledge for 30mm or 3cm thick or above for a custom top. There are no buttons to press to get the unit to pop up, simply press the top and the heavy duty counter weights pop the unit up. There is no spring to ever fail, to close it just press the top till it latches. The wooden slot has been treated with food safe grade natural oil that is FDA and USDA approved for safety, however this can be cleaned off if desired. 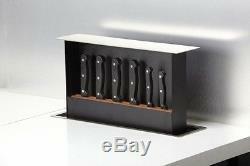 The Knife Box is a stylish way to add organization to your kitchen or any countertop where you want a high quality pop up knife box or the ability to add your own custom top. Keep sharp knives out of drawers and stored safely away from kids. The item "S-BOX Knife Box Kitchen Countertop Pop Up Knife Box Stainless Steel or Custo" is in sale since Tuesday, June 28, 2016. This item is in the category "Collectibles\Kitchen & Home\Kitchenware\Boxes, Bread". 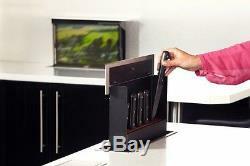 The seller is "talha_gursoy" and is located in Montgomery Village, Maryland. This item can be shipped to United States, Canada, United Kingdom, Denmark, Romania, Slovakia, Bulgaria, Czech republic, Finland, Hungary, Latvia, Lithuania, Malta, Estonia, Australia, Greece, Portugal, Cyprus, Slovenia, China, Sweden, Taiwan, South africa, Thailand, Belgium, France, Hong Kong, Ireland, Netherlands, Poland, Spain, Italy, Germany, Austria, Israel, Mexico, New Zealand, Philippines, Singapore, Switzerland, Norway, Qatar, Kuwait, Bahrain, Croatia, Malaysia, Brazil, Colombia, Costa rica, Panama, Trinidad and tobago, Guatemala, Honduras.